Greener lives are increasingly being followed by eco-deaths. A natural burial is a natural way to celebrate life, a way of giving back to nature and the environment a gift for future generations, the gift being a protected nature rich environment. As people become more aware not only of their responsibility to the environment but also of their ability to choose where their ultimate resting place will be, more and more are turning to natural burial, where their impact on the environment is considerably less than that of cremation, and where they know they will rest in a beautiful, natural setting. 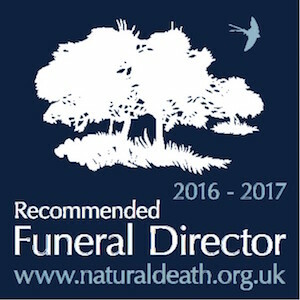 A natural burial is an ethical choice with no neglected grave and no burden to survivors charged with responsibility of grave visiting and maintenance. Instead of headstones wild flowers, meadows and trees mark the grave, a true symbol of life and eternity-all part of the circle of life. A traditional religious service is appropriate for some people. For others, a totally non-religious ceremony, or 'semi-religious' service is more apt. Some families/friends conduct all parts of a ceremony themselves or there are celebrants who can help you. You may want no service at all. The choice is yours. There are a whole variety of reasons why someone might choose to have no funeral ceremony. Sometimes it is the express wish of the person who has passed away that no-one should attend their funeral for whom simplicity is the preferred option. Many people these days chose to have a service of thanksgiving or even a celebration at venue such as a golf club, either immediately or at a later date. 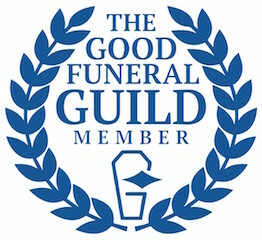 Option one includes the purchase of the grave plot, preparation of the grave plot, bringing the person who has passed away into our care, caring and preparing them, providing a cardboard coffin, (other coffins are available at extra cost, please contact us for details) transportation to the natural burial ground (in a suitable estate car) , ongoing support to the client and providing staff on the day of the burial. This could either be attended or not attended, but would not include somebody to officiate a service. Option two is the same as option one but would include some to officiate i.e. Minister, Vicar, Humanist or Civil Celebrant. Option Three is the same as option two but includes the use of a traditional hearse for transportation to the Natural Burial Ground. *Please note that Newspaper notices and any other third party costs are not included in the above, but we would be more than happy to help you with these. **Full payment is required prior to arrangements being made.